Creative dishes with the perfect combination of wine and our attentive service will convince you at all levels. The "Parkhotel Schönblick" is a 4 stars hotel in the heart of Reischach. You will sleep in beautyful rooms. You can relax every day at the indoor pool, or in the wellness area with relax room. Of course the whole sauna area is also open for you. In our "Bella Vita Beauty Farm" you will be spoil with a lot of beauty treatments. In the summer you can take a sunbath in our quiet, great meadow behind the house with free deck-chairs and sunshades. We are glad to inform all golfers that at 500 m from our hotel there is a new golf course with 9 holes and that our guest will have a price reduction of 100%.You can also use our free mountain-, city- and familybikes to explor the beautyful area. In the winter our free skibus will bring you to the lift of the Skiarea Kronplatz (at 300 m). The cross-country skiers can use the 10 km piste directly in front of the hotel.Other inclusive services: a welcome aperitif at the house bar, every afternoon free cold buffet on the house bar. Elegant double room with sitting area ~ ca. 26 m² With cosy sitting area and most of the times with balcony, partially with wooden floors, satellite TV with Sky1, radio, telephone, safe and minibar. Bathroom with WC, shower or bathtub, partially with bidet, underfloor heating and heated towel rack, cosmetic mirror, hairdryer, beauty kit, bathrobe and slippers. The photos are sample images, the single rooms may be slightly different. Spacious double room with tiled stove ~ ca. 35m² With balcony and spacious living area with tiled stove, partially with wooden floors. With satellite TV with Sky1, radio, telephone, safe and minibar. Bathroom with window, WC, shower and/or bathtub, most of the times with bidet, double washing basin, underfloor heating and heated towel rack, cosmetic mirror, hairdryer, beauty kit, bathrobe and slippers. The photos are sample images, the single rooms may be slightly different. Two floors with dreamlike panorama ~ ca. 70 m² Suite on two floors with living and sleeping area, walk-in closer as well as terrace with a unique view. With satellite TV with Sky1, radio, telephone, safe and minibar. WC and bathroom with WC, shower and bathtub, bidet, double washing basin, underfloor heating and towel rack, cosmetic mirror, hairdryer, beauty kit, bathrobe and slippers. COMFORT double room for single use ~ ca. 26m² With cosy sitting area and most of the times with balcony, partially with wooden floors, satellite TV with Sky1, radio, telephone, safe and minibar. Bathroom with WC, shower or bathtub, partially with bidet, underfloor heating and heated towel rack, cosmetic mirror, hairdryer, beauty kit, bathrobe and slippers. Comfortable suite with panoramic terrace ~ ca 54 m² Cosy lounge area with tiled stove as well as large rooftop terrace. With satellite TV with Sky1, radio, telephone, safe and minibar. Bathroom with WC, shower and bathtub, bidet, double washing basin, underfloor heating and heated towel rack, cosmetic mirror, hairdryer, beauty kit, bathrobe and slippers. Inviting suite with living & sleeping area ~ ca 54 m² With balcony as well as separate sleeping and living area with tiled stove. With satellite TV with Sky1, radio, telephone, safe and minibar. WC and bathroom with WC, bathtub, bidet, double washing basin, underfloor heating and heated towel rack, cosmetic mirror, hairdryer, beauty kit, bathrobe and slippers. Well-being room with garden view ~ ca 24 m² With balcony, partially with wooden floors, satellite TV with Sky1, telephone, safe, minibar. Bathroom with WC, shower or bathtub, partially with bidet, hairdryer, beauty kit, bathrobe and slippers. The photos are sample images, the single rooms may be slightly different. Our Standard and Simple Rooms are a little bit smaller and have smaller bathrooms. If you would like to have more spacious rooms, we recommend our Comfort and Deluxe rooms. Double room with modern furnishings ~ ca 20 m² Most of the times with balcony, partially with wooden floors, satellite TV with Sky1, telephone, safe, minibar. Bathroom with WC, shower or bathtub, some with bidet, hairdryer, beauty kit, bathrobe and slippers. The photos are sample images, the single rooms may be slightly different. Our Standard and Simple Rooms are a little bit smaller and have smaller bathrooms. If you would like to have more spacious rooms, we recommend our Comfort and Deluxe rooms. Single room ~ ca 10-12 m² Modern comfortable facing the street, cable and satellite TV, safe, telephone, minibar on request, WC, shower, hair-dryer, bathrobes, slippers and courtesy set. Two bedrooms for kids and adults ~ ca. 32m² With small balcony and two separate bedrooms with separable double beds, situated in the attic. With satellite TV with Sky1, telephone, minibar. Bathroom with WC, shower, hairdryer, beauty kit, bathrobe and slippers. Vriendelijk personeel en steeds gedienstig! Everything was great. Staff was super kind and friendly. Food was delicious. Our compliments to the chef! The hotel is very clean and comfortable! Rooms are warm and cozy! Kitchen is outstanding! Personnel in the restaurant is very polite! Good location to the slopes. High quality of everything, very nice swimming pool and good welness area, greate cuisine. Location, tidiness, excellent cuisine, kind and helpful personel. Спасибо То&#1084;асу за вни&#1084;ание и желание по&#1084;очь в решении любых вопросов. Спасибо шеф- повару за вкусные, разнообразные и великолепно сервированные блюда. Официанта&#1084; за вни&#1084;ание и профессиональное обслуживание. Food! It has been always Schoenblick's forte still is. Great, warm swimming pool, nice wellness area. Great hotel indeed. Food , hospitality of personel ! There is no limit to the service level of the staff; very friendly in many languages. Everything! This was our 3th time in Hotel Schönblick. Great place, the food is the best and the team is top!! Another big thank u to Madame Schönblick and the team for the birthday wishes and the gift! Very much appreciated!!! See u all again next year!! Everything in hotel is perfect, but the main things are atmosphere, restaurant and 3/4 pension at all, lobbies, location, everything is good. It was our 6th or 7th time in hotel, we like it. The general impression is very positive: good location, restaurant, swimming pool & sauna area, clean room, garage. Friendly and helpful staff. Excellent dinner. The food and the spa. It's not easy to tell. The swimming pool is great, water temperature is perfect for slow swimming. Room was nice too, afternoon snack as well. But hotel's forte is definitely gastronomy. Deserves the highest marks! This is not a regular luxury hotel food, it's much more. Congratulations! The New Year's Party was beautiful and elegant ready, we danced and we sang with all guests. I was impressed by the refinement of foods, their preparation and especially taste! Delicious food and great, friendly personnel. Wonderful golf experiences and relaxation: with free green fee, soothing massages and many other extras for golfers and gourmets. Relaxing holidays and learning how to paly golf under professional supervision: Our golf week with intensive course to be officially golf-approved makes all this possible! Would you like to benefit from your holidays in order to improve your handicap with the support of a pro? 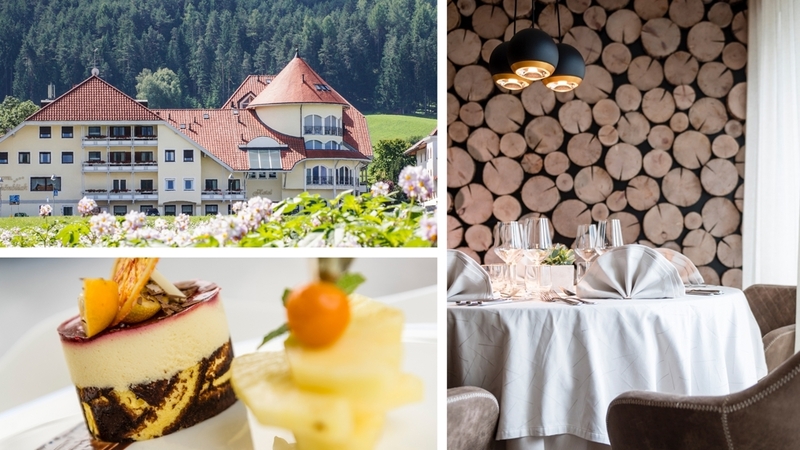 In this case, the Golf Hotel Schönblick will be the best choice for you! Take a small break & return more than relaxed: Enjoy a regenerating short trip with pleasures and well-being! Sunshine, flowerage & many delicacies: Here in Pustertal, springtime is an experience for all senses! Summertime is holiday time – and the nature paradise right at our doorstep will offer you endless possibilities to enjoy the warm months to the fullest! Enjoy the last warm days, spend a lot of time outdoors and enjoy your time at the fullest: autumn holidays in our Hotel Schönblick! Are you looking for a varied holiday, discovering the variety of the South Tyrolean mountain landscape? In this case, the hiking week with our hiking guide Josef will be the best option for you!